Happy International Women's Day. What amazing stories we have seen from women all over the world. "Keep your dreams big and your aspirations high." The amazing Rebecca shares her journey of overcoming her self-confidence issues and making a wonderful change for the better. Rebecca you have shown us the importance of self-love and that is the number one reason we need to look after ourselves. I hope many people that read your story have the same "AHA" moment you had and make the appropriate changes in their lives! Next week I turn 31! Last year about 2 months before I turned 30, I decided to take back control of my life. My health was out. of. control. I started on a clean eating plan (which turned out to be a lot of fun) and a fitness program that I did at home. 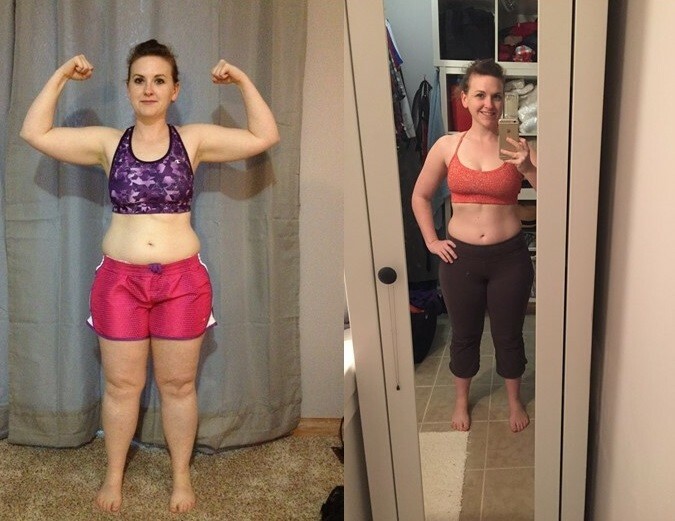 Within a month, I began to see a noticeable change in my body and in the way my clothes fit! I've kept it up even when things got a little rough AND I'm so happy to say that I'm down 4 sizes a year later and I'm not even close to being done! I can honestly say that this has become a lifestyle for me and I'm thrilled to see the changes in my spiritual self, body and mind in the next year. Looking back on my years as a child, I realized we ate a lot of carbs, mixed with veggies and a lot of meat. As I grew up and was able to choose my own food (college, living on my own, etc) I begin to rely on fast-food for my busy lifestyle. I knew it wasn't healthy but it was so super easy and I was just truthfully being very lazy. After my husband and I met, I began to change my eating habits. I wasn't feeling well, I didn't sleep well, I was lacking self-confidence and I definitely did not feel good in any of the clothes I owned. I decided a few months before I turned 30 that I didn't HAVE to feel this way, so I just woke up one day and decided I had had enough. I have never looked back since! Now my husband and I both eat clean and try to live an active lifestyle. I do not have time to play any sports at this point in my life, but I work out 5-6 days a week doing anything from cardio, to Pilates, yoga, and even weight lifting. I love to watch football and soccer though! I am a Spanish teacher, so I have a passion for anything language and culture related. I love to travel and learn new things. My husband and I enjoy watching new movies and doing anything hands on or craft/art related. I woke up one morning really tired of feeling so awful inside and out and tired of looking at the girl who had zero self-confidence. I decided I had to change, and I would not spend my 30s as a self-conscious unhealthy mess. Never give up! You can be off your game for a day, you can get sick and rest, you can eat a really yummy but unhealthy meal or two. You can even feel sorry for yourself for a few minutes. But you have to get back up and work hard! There will be days where you will think EVERYONE has got it together and you are a hot mess. Do it anyway! You do NOT have to be perfect, but you DO have to keep trying! :) One day you will really love the person who is staring back at you in the mirror! To keep up with Rebecca’s transformation and learn more from her about the mindset of change, follow her on Facebook and Instagram!